Earlier this week, Accredo Specialty Pharmacy informed me that the next batch of my chemotherapy tablet (Temozolomide) prescription is ready, and it has a ~$4,500 co-pay that I have to pay. It came as a bit of surprise since the first two batches were fully paid for by Anthem Blue Cross Blue Shield - the medical insurance I have been on since 2016 through the Obamacare Marketplace Exchange. Since this is the start of a new year, the copays and deductibles reset and I have to pay the maximum-out-of-pocket amount ($6,500) before the insurance company starts paying for all the expenses. So it is not a big deal that I have to pay ~$4,500 for the next batch of my chemo therapy tablets. Instead of paying out the out-of-pocket-maximum amount through the year like I did in 2016, I will be paying a big chunk of it at the beginning of the year. The insurance company will pay for all the expenses beyond $6,500. After a perfectly healthy life with no serious medical issues for 44+ years, and with no major symptoms to herald a severe health issue, I start having a strong bout of nausea, vomiting, and disorientation the morning of Sunday November 13th. The nausea and disorientation get worse through the day and that night. I lose consciousness around 5AM the next morning (Monday November 14th); that's the final straw and I am taken to the Longmont United Hospital by emergency services. The duty doctor examines me in the morning, suspects a brain issue, and orders CT Scans/MRI scans to further investigate. The scans confirm there is a big mass on the top-right-side of my brain. This is at around 8:30AM of Monday November 14th. The machinery kicks into action; right people get involved; a surgery to remove the brain tumor is scheduled for that afternoon. The surgery starts at 2:00pm the same day, goes on for a couple of hours, and is later deemed to be very successful. I stay at the hospital for 2 more days, and am discharged to go home on Wednesday November 16th. After taking a break of 3 weeks, I am back to work as a freelancer on Monday 5th December. On Friday December 9th, we meet with the Medical Oncologist to discuss the diagnosis & the prognosis from the surgery. 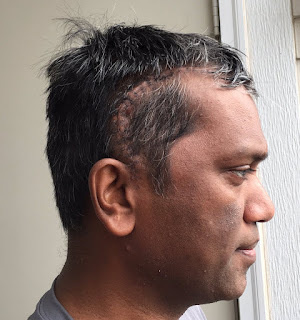 The biopsy on the resected tumor results in a diagnosis of Glioblastoma Multiforme (GBM) - the most aggressive form of Brain Cancer, and one without a cure as of now. The Medical Oncologist prescribes a 6 week Radiation therapy + Chemo therapy treatment plan to start with. This is supposed to be followed with multiple bouts of Chemo therapy treatments over the next 6 months. I start on the 6 week Radiation therapy + Chemo therapy treatment on Tuesday December 20th. The whole process - from me falling sick, to brain tumor being identified, to surgery, to recuperating at the hospital for 2 days, to follow up treatment - all of it has gone smoothly mainly because of the financial guarantee provided by the good medical insurance I had. Thanks to the smoothness of the process, the surgery was without any undesirable side-effects, and I was back to full health very quickly. Me on 2nd Dec 2016, after the sutures were removed. If I did not have good medical insurance, there would have been delays and diversions at each of the above steps to arrange for money to pay at that step before the (medical procedure / next action) could proceed. And such delays and diversions could at worst have led to my death, and at a less worse case, led to the surgery and recovery taking longer or leaving me with some undesirable side-effects. The premium for my medical insurance in 2016 was $687.55 per month. That is for the three of us (me, my wife, and our 3 year old daughter). I used to think it was expensive. Not anymore. The insurance paid nearly $175,000 through my brain surgery ordeal and the follow up treatments. So I would say I have been very fortunate to have had a good medical insurance. I am not really minding the fact that the premium went up to $877.07 per month in 2017. I am thankful for the Affordable Care Act (Obamacare) for allowing me to have such good medical insurance while I work as a freelancer. What does the future hold, especially with the ongoing efforts at repealing Obamacare? No idea, but for now I am very scared of the possibility of not having adequate medical insurance to cover for my ongoing treatment needs for the next few years. I will quite likely need more surgeries, radiation therapy, chemotherapy, immunotherapy, etc. to keep GBM at bay over the next few years. I don't think I will be able to bear the costly expenses for these procedures all by myself. Getting help from family, friends, and strangers through a GoFundMe campaign is an option, but the expenses are quite likely to be beyond the reach of the goodness of people. If the repeal of Obamacare comes about and results in me not having affordable medical insurance, the ongoing cancer care I need is likely to be out of my reach.